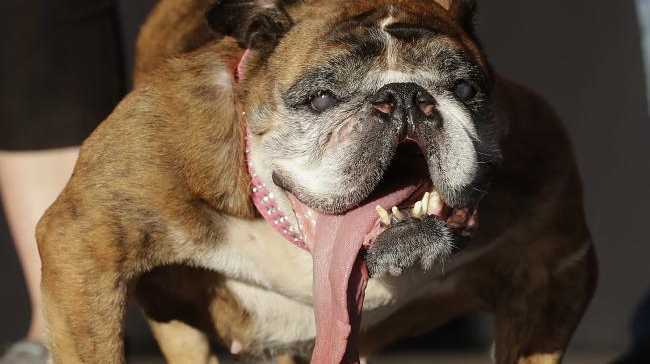 ZSA Zsa, an English bulldog who won the title of World's Ugliest Dog last month, has died. The 9-year-old pooch passed away in her sleep Monday night, her owner Megan Brainard, told the Star Tribune. The quirky canine won the 30th annual contest in the San Francisco Bay Area on June 23, where she wowed judges with her underbite and muscular, rounded front legs. She showed off a glamorous pink collar and painted nails on the day, paired with a tag that read "big girls drool". Her owner was awarded $1,500 for Zsa Zsa's win. Zsa Zsa was up for the title of Ugliest Dog against some fierce competition: a blackhead-covered Chinese crested-dachshund mutt, a bulldog mix with excess wrinkly skin and a Pekingese named Wild Thang. After she was made top ugly dog, her family said: "We are so excited for her; she deserves this." She became an instant celebrity after he win, and flew from San Francisco to New York to grace the Today show with her presence. Organisers of the annual contest say the event is "a fun and silly way to advocate that all animals deserve a safe and loving home." Ms Brainard, of Anoka, Minnesota, adopted Zsa Zsa after spotting her on Petfinder. The dog had previously been rescued from a puppy mill in Missouri when she was 5 years old, according to the newspaper. The dog mum said she named Zsa Zsa after the Hungarian actress Zsa Zsa Gabor, as the pup enjoyed lounging on the couch "like a beautiful model." This story originally appeared on the New York Post and are republished with permission.